Lowell, MA - January 13, 2016 - It’s that time of the year again when millions of people vow to turn over a new leaf by making their New Year’s resolutions. Global research* conducted by Jabra has revealed that more than 40% of people are resolving to make their bodies stronger and fitter in 2016, rather than opting for more traditional resolutions of just focusing on weight loss. With over half of people surveyed (52%) admitting that they have never made a fitness related New Year’s resolution before, 2016 looks to be the year of first-time resolutions with people focusing their attentions on a healthier and fitter lifestyle. 2015 has seen a healthy shift away from the traditional ‘thin’ celebrity images depicted in magazines, to the more favorable ‘fitspiration’, ‘real body’ trends led by social media channels such as Instagram. This refreshing shift in attitude reveals an increased emphasis on strength and fitness training and dispels the notion that most people either won’t make a resolution, or will simply fail to reach their goals. Teamed with growing confidence, 67% of people feel completely confident that they will stick to their fitness resolution. A determination to succeed is clearly evident with 45% admitting while they may take a few breaks, they will still ultimately accomplish their goals. Finding and sticking to a New Year’s resolution is no easy task, motivation is clearly the key to success. Over 35% are motivated by music with another 34% saying that the buzz they feel post-workout is what inspires them most. To succeed, 68% revealed they would almost certainly consider investing in some sort of technology to keep them on track. 57% would most likely purchase new sports ear phones and 39% would invest in a fitness tracker or GPS device. Jabra has conducted this research to prove just how much sound and hearable technology play a part in people’s fitness and training goals. With motivation being the key to success, an overwhelming 82% of people surveyed reveal that they currently use some form of technology to assist them when they work out. The majority (69%) utilize music through in-ear buds to spur them on, 33% use some form of fitness tracker/GPS device, 26% use a heart rate monitor and 27% use a running or training app. 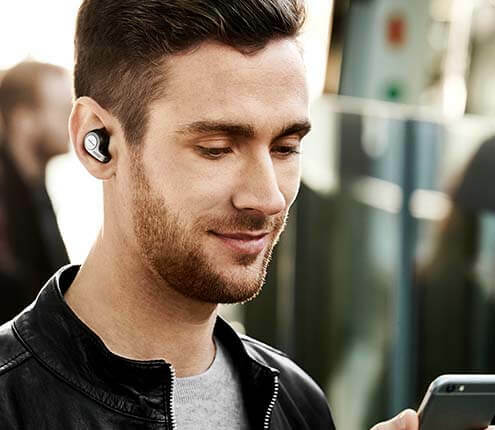 Jabra’s wireless sports earbud range offers superior, state-of-the-art hearables and has been developed using Jabra’s heritage and unrivalled R&D expertise in delivering audio innovation. It is designed specifically to deliver the combination of intelligent in-ear coaching or training tips and music to sports enthusiasts. Features such as heart rate monitors (Jabra Sport Pulse Wireless) and motion sensors (Jabra Sport Coach Wireless) combined with the Jabra Sport Life app, can significantly enhance any workout. The free app which has been developed by Jabra, offers the ultimate all-in-one solution and contains optimized tools to help plan and monitor your fitness. Whether you’re a casual gym goer or a seasoned triathlete, there is a headset to cater for your workout needs. Designed to US military standards and leading the market in audio fidelity, Jabra’s innovation enables you to hear more, do more and be more. As a result of this research, Jabra has initiated a new online community (the Jabra Fitness Community) to further support those that have set a fitness or training goal for the New Year. In addition to their portfolio of products, Jabra will be offering motivational and inspiring tips for success from fitness and training professionals, as well as highlighting “real” updates from those in the Community who share their progress and highs/lows. The Jabra Fitness Community can be found at: http://thisiswherewestart.jabra.com/ and posts can be made to #thisiswhereitstarts. *Research conducted by Enalyzer for Jabra on December 2015. Global survey polling 1580 people across USA, Malaysia, Australia, Canada, Japan, Brazil, UK, The Netherlands, Singapore, Germany, New Zealand, Denmark, Romania, Trinidad and Tobago, Sweden, France, Puerto Rico, Norway, Switzerland, Hong Kong, Poland, Israel, India, Mexico, China and Nigeria. Jabra Sport Pace is available now at a suggested retail price of USD 99.00. 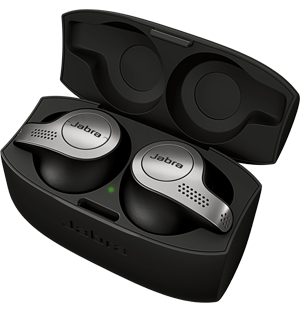 Jabra Sport Coach is available now at a suggested retail price of USD 149.99.